If you're ready to Jumpstart your community, or learn more about what it takes - we've got what you need. If you’re an individual who wants to develop properties, start here. What does it take to Jumpstart Your community? 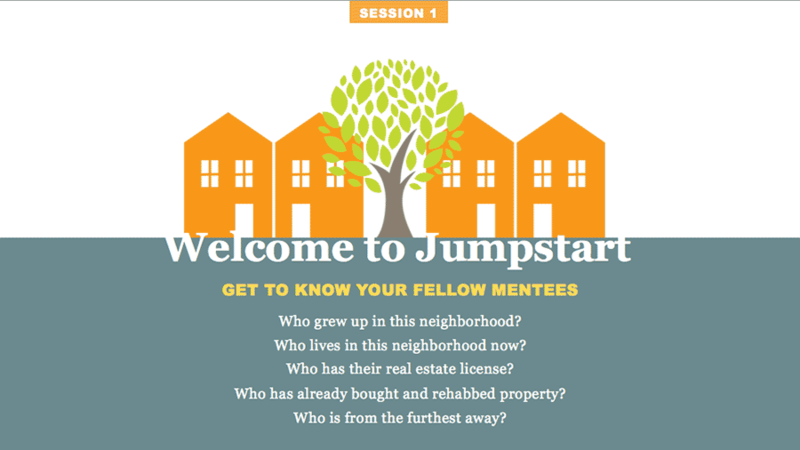 The Jumpstart “How to” Guide is an overview for neighborhood leaders who want to start a Jumpstart Program. Whether you are ready get going with a Jumpstart Training Program, set up a Developers’ Network, or lay the groundwork for a Loan Program, the “How to” Guide is the place to start. Ken Weinstein, Jumpstart Germantown, and Carolyn Placke, Philadelphia LISC, presented "Jumpstart Germantown: Encouraging Local Entrepreneurs to Rehab Deteriorated Residential Properties" for the Housing Alliance of Pennsylvania. You can listen to the webinar and follow along with the powerpoint presentation. Read the Jumpstart “How to” Guide. Evaluate your neighborhood’s real estate market by consulting with local real estate professionals. Determine what organization(s)/individuals will run your Jumpstart Program. Identify resources and needs to determine which Jumpstart initiatives and doable and will work best in your community. investigating financing options for developers. Tell us about yourself, your level of experience, and your neighborhood, and we’ll advise you how to move forward. This is the place to submit any initial questions about setting up your Jumpstart Program. The Training Program consists of 3 classes (9+ hours of instruction) covering the 7 JumpSteps of real estate development, a visit to a construction site, and access to an experienced mentor. This 60-page workbook covers the basics that an aspiring developer needs to get started in the exciting world of real estate development. These 35 slides provide an overview of the Jumpstart Training Program and accompany the workbook. Mentors are an important part of the Training Program, so you'll need to identify knowledgeable individuals who can help guide participants. Ultimately, you will want to find enough mentors to spread the workload. The Developers’ Network creates opportunities to make connections and build mutually beneficial relationships. Through networking events and social media, you can reach a larger group of interested individuals, connecting like-minded developers and neighborhood stakeholders. Consult the “How to” Guide for tips on starting a Developers' Network. A Loan Program provides developers with options for acquisition and construction financing so they can invest in local projects. These are documents that Jumpstart Germantown uses in its Loan Program. Use these as a starting point in creating your own Jumpstart Loan Program. You will need to adapt them to fit your Jumpstart priorities and goals, and comply with state and local laws.